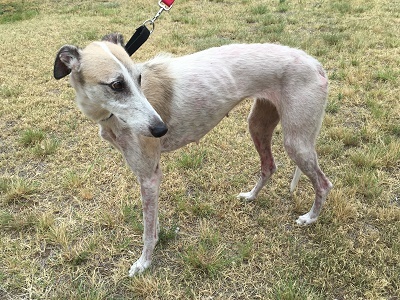 Clara Belle is an approximately 8 year old white and fawn female staghound who arrived to GALT’s family as an owner release. Her outside living conditions when she was picked were horrific especially for a dog of her size. She was very underweight as well as she had a severe skin condition caused by a heavy flea infestation. Clara Belle has now gained weight and her skin has healed beautifully. She is a very smart girl and she knows some basic commands. It is not known at this time if Clara Belle is small animal or cat tolerant. Clara Belle is a lovely 8 year old staghound. She was an owner release and came to us with some minor health issues. First, she had a skin condition which was caused by a flea infestation. She has healed nicely and her coat has come in beautifully. Second, she was a little underweight and that resolved itself quickly since Clara Belle is a big fan of food! She gets along well with several dogs in her pack and while it seems she may prefer to be the alpha, she is doing a good job of accepting that she is not. Clara Belle has great bathroom habits, knows how to use the doggy door and has no accidents in the house! She knows some basic commands such as “sit”, “stay”, “down”, and can even do handshakes. And, Clara Belle is a cuddler! 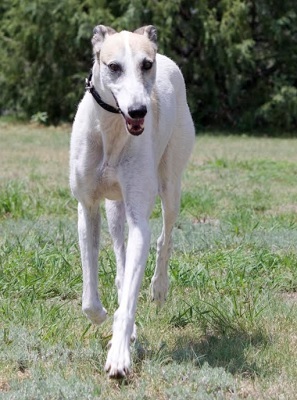 This beautiful staghound is looking for a good and loving home! The special medical treatment cost needed by Clara Belle is why the Miss Mesa Fund was established. If you would like to help with Clara Belle's care, please take a moment to make a donation to the fund. 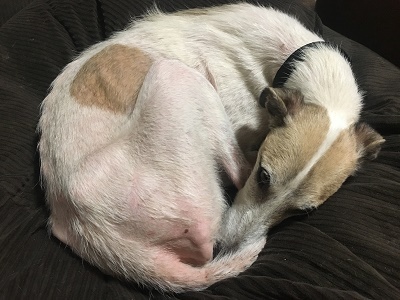 You WILL and CAN make a difference in Clara Belle's life and the lives of other greyhounds in need of special medical care. Your help and support will make a difference - one greyhound at a time. Please note Miss Mesa Fund/Clara Belle on your check.